Thomas Jefferson (April 13, 1743 – July 4, 1826) was the third President of the United States, the principal author of the Declaration of Independence, and an influential Founding Father. 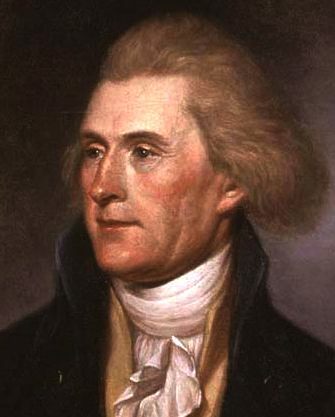 Jefferson was 36 years old when elected Governor of Virginia by the legislature on June 1, 1779. Albemarle County is a well known birthplace and home of Thomas Jefferson. He designed both Monticello and the University of Virginia which both appear on the United Nations Educational, Scientific, and Cultural Organizations World Heritage List. Jefferson was husband to Martha Jefferson and the son of Jane (née Randolph) and Peter Jefferson. Jefferson's home was Albemarle County, and he is inexorably linked to Charlottesville-Albemarle. Owner and designer of Monticello. As U.S. President, champion of the Lewis and Clark Expedition (1804–1806), including the selection of other local Meriwether Lewis. Many local businesses and organizations are named for Jefferson. ↑ Barefoot, Coy. Thomas Jefferson on Leadership: Executive Lessons from His Life and Letters. New York, NY: Plume, 2002. Print.